Brad Dokken / Rick Swenson / ATI Composite Rick Swenson both during (left) and at the end of (right) his record-breaking journey. 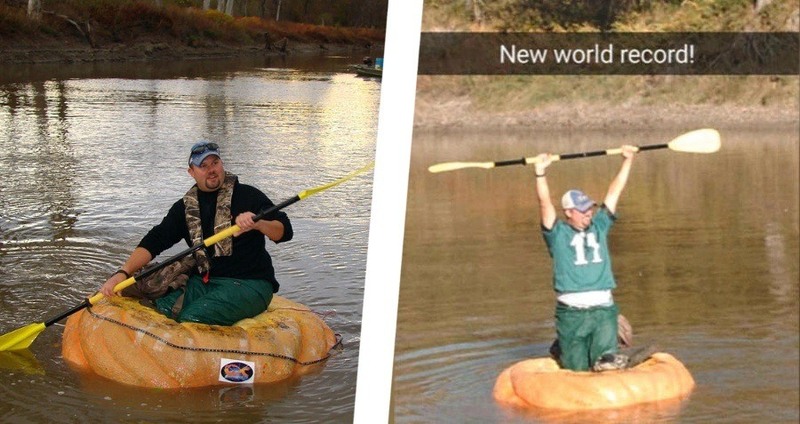 This past Saturday, it turns out that not one but two men were trying to break the world record for greatest distance paddled while floating in a giant pumpkin. But history doesn’t care about losers and thus the world will only remember Fergus Falls, Minn.’s Rick Swenson, who paddled a record total of 26 miles in a 1,086-pound pumpkin down the Red River from Grand Forks, Minn. to Oslo, Minn. over the course of 13 hours and 40 minutes. 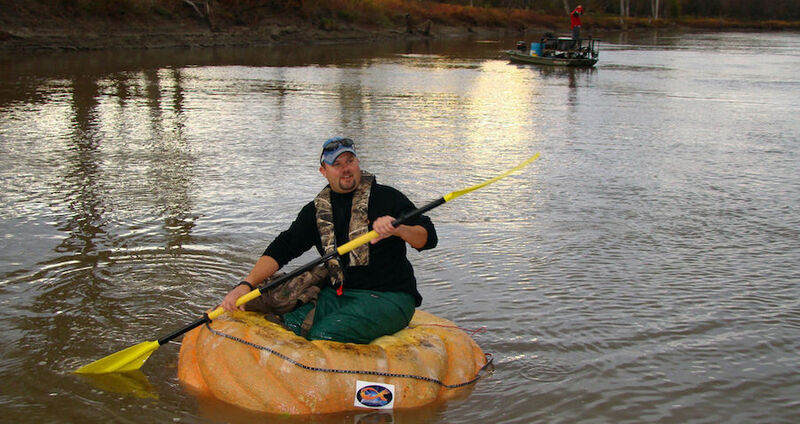 Swenson, a 35-year-old giant pumpkin farmer, accomplished this lifelong goal with the help of his family and friends, who were right there alongside cheering him on in two support boats. They carried an extra 1,057-pound pumpkin in case anything happened to Swenson’s primary floating vegetable, as well as a barbecue for burgers and sausages, according to the Bismarck Tribune. And as strange as paddling in an enormous pumpkin is, Swenson is indeed used to giant pumpkins. On his farm, he often plants the Howard Dill’s Atlantic Giant variety of pumpkin to make sure that his large pumpkins can grow heavier than 2,000 pounds. With pumpkins like these, Swenson has been scaring young children for the past five years at the Chahinkapa Zoo in Wahpeton, N.D., carving out gargantuan jack-o’-lanterns for spooky holiday events. The world-record-breaking pumpkin in question will go on display there until it is fed to animals after Halloween. It will take Guinness several weeks to confirm Swenson’s title as a man who paddled farther than anyone else in a pumpkin, but it will happen. Guinness was contacted back in April about the record, and they approved the attempt in August. Swenson will need to send a two-minute video for every hour he paddled, a GPS record of the voyage, and the testimony of two unaffiliated witnesses who observed both the trip’s beginning and end. And if you’re wondering exactly how Swenson did it, he first rigged the pumpkin with orange LED lights to look cool. He then turned the flat side up — giant pumpkins have flat bottoms — and cut a hole. He then sat in the hole. The pumpkin then rode low in the water, like a giant floating bagel. Next, find out how pumpkin spice took over fall, before discovering where jack-o’-lanterns come from.